May 20, 2015 -- HAMBURG - "Sherlock Homes is nothing compared to a radiologist," Dr. Adrian Dixon pointed out in an interview with the congress newspaper at last week's German Radiology Congress (DRK) in Hamburg. Dixon, who is professor emeritus at Cambridge University's radiology department and former editor in chief of European Radiology, received honorary membership of the German Radiological Society (DRG) at the meeting. There are two main reasons he pursued a career in radiology. First, when he was doing postgraduate training in internal medicine, he realized he enjoyed the detective work involved in making the diagnosis. Radiology has become the ultimate detective agency, Dixon quips. Second, he knew that he would become deaf in later life, and radiology would be an appropriate career choice. Dr. Adrian Dixon receives honorary membership from the outgoing DRG president Dr. Norbert Hosten. All photos copyright of DRG - Deutsche Röntgengesellschaft e.V. "I had not quite foreseen how interventional procedures would become such an important part of radiology and that communication with the patient is crucial!" he said. "If there is a downside to radiology, I suppose it would be the turf battles. However, these only occur because of the success of radiology!" He thinks there is a need for more international collaboration, especially for large, multicenter research projects. Also, he expressed disappointment that radiology has never managed to fuse training in radiology and nuclear medicine. "Radiology keeps evolving and that is what makes it such fun," he commented. "Because of the increasing workload, it is probable that radiologists will end up concentrating on the new emerging techniques and the more complicated patients and investigations. Indeed, it is likely that some of the simple examinations may be reported using computer-assisted detection/radiographic reporting/etc. This would mirror the development of obstetric ultrasound originally in the hands of radiologists/radiographers, but now devolved down to other professional staff." Let's dance! The congress organizers and DRG staff entertained delegates at the meeting. From the left are Rebecca Lefers from Interplan Congress, Meeting and Event Management, Ulrike Schiedt from the DRG, Bruno Lichtinger from Interplan, and Dr. Stefan Lohwasser. Dixon, who was very involved in the beginning of body CT and has written extensively on abdominal CT and lumbar spine, said three people had a major influence on him: Prof. Tony Mitchell, an internal medicine specialist at Nottingham, for making him inquisitive; Dr. Ian Kelsey Fry, former director of the Barts Foundation for Research, for getting him interested in investigative radiology; and Dr. Thomas Sherwood for supporting him in everything in Cambridge radiology. "Honorary membership gives me a huge sense of pride, both for the university department of radiology in Cambridge and everybody at the ESR [European Society of Radiology] and elsewhere involved with European radiology," he said. "I am very proud and grateful to all my friends in German radiology." As editor in chief of European Radiology for six years, he liaised with numerous German radiologists. He said he very much appreciated German radiologists for being such efficient reviewers, editors, and deputy editors. Dr. Walter Heindel, chair of the department of radiology at the University of Münster and a famous academic breast radiologist, gave an overview on the results of population-based screening at his institution. The loss to follow-up is almost zero, leading to an excellent epidemiological quality of data in his research, and the results are very promising. In fact, a downsizing of tumors detected in the screening program has already been proven, meaning that the average size of breast tumors is significantly smaller. This is one reason why women taking part in the screening program are less likely to receive highly aggressive treatment, such as more extensive surgery or chemotherapy, he explained. Interim results are very encouraging, but the ultimate proof of the screening program's efficacy however is still missing, however, and it still will take many years to complete the task. Contrast-enhanced spectral mammography shows a small satellite lesion (arrow) lying dorsally in relation to the primary finding, as well as a third lesion in the mediolateral oblique view projected on to the pectoralis major. This was in a high, deep position and did not appear on the craniocaudal view due to the settings. Image courtesy of Charité Berlin and DRG. Dr. Carmen Perez Fernandez from the Berlin Charité university hospital shared new data on contrast-enhanced spectral mammography (CESM). 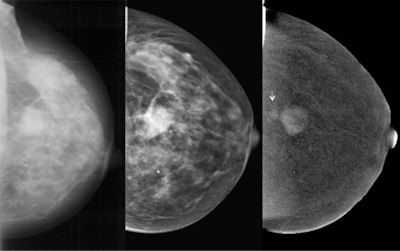 This technique requires little more radiation exposure than conventional mammography, but enables the visualization of tissue vascularization. Similar to breast MRI, intravenous contrast-agent injection is necessary, but in the case of CESM, iodinated contrast agent is used. In a study of 118 patients, the sensitivity of CESM reached 78%, whereas specificity was still moderate (about 50%). Although the future role of CESM has to be defined in ongoing research, the technique looks particularly promising when breast MRI is not available. Everybody remains curious about the further development of the method. Big data has become a popular topic in radiology. Dr. Pascal Baltzer from Vienna, an expert in breast MRI, shared some of his personal views on this topic. On the one hand he illustrated the ever-increasing data volume being collected for a single examination. We only have to think of the many parametric maps from diffusion-weighted imaging (DWI), intravoxel motion imaging (IVIM), diffusion-tensor imaging (DTI), diffusion-kurtosis imaging (DKI), and MR spectroscopy, he noted. These are all important parts of the puzzle -- think of the Sherlock Homes analogy from Dr. Dixon -- but they never tell the whole truth alone. So the question is how to read all this huge amount of data and not get distracted by redundant information. Indeed, this question remains unsolved. Attendance at the DRK held up well again, as the sidbar shows. For the last time, the world's oldest meeting dedicated to medical imaging took place in Hamburg at the CCH (Congress Center Hamburg). Certainly it is sad to say goodbye to the maritime capital of the north and its centrally located congress venue. Everything around the CCH has become so familiar during the last years: the vibrant urban street life, the cozy Dammtor train station with its well known cafés and snack bars, and the wonderful recreational park "Planten un Blomen" close to the congress venue. 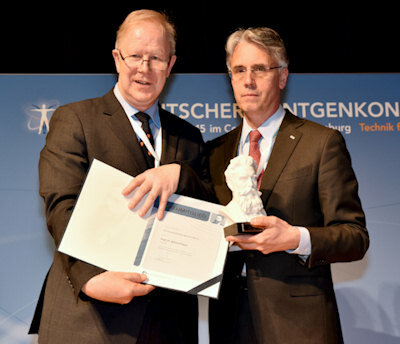 Dr. Gerhard Adam, professor of radiology at the UKE University Medical Center Hamburg Eppendorf, was this year's congress president. He proudly presented the motto for the meeting: "Technik für Menschen" (technique for the human beings). What a wonderful summary of radiologists' work in just three words. High-tech and highly sophisticated imaging methods are available to radiologists, yet we must never forget our real mission and never lose sight of our real goal: To serve our patients. Technology should never be a distraction, it should be a tool. "Technik für Menschen," nothing else. Again the program contained a well balanced mixture taken from the whole spectrum of radiology. This included of course the well-known teaching format "FFF" ("Fit für den Facharzt," "Fit for the board certification examination") and classical refresher courses. As usual, lectures contained the freshest data available. Not surprisingly, a special session was dedicated to the ground-breaking data from MR CLEAN, EXTEND-IA, ESCAPE, and SWIFT-PRIME. What sounds like weird acronyms is nothing but the names of four important studies on mechanical revascularization in acute stroke. All of them are having an excellent impact of patient outcome when an endovascular procedure is performed in addition to systemic thrombolysis. This will change the picture and certainly will increase the role of (neuro-) radiology in the treatment of stroke patients. And they're off! 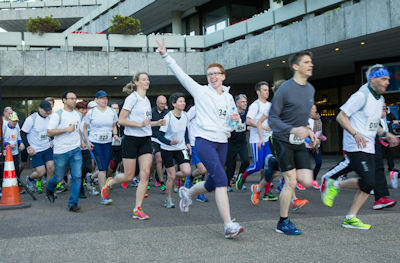 A charity fun run (spendenlauf zugunsten) forms a traditional part of the DRK. 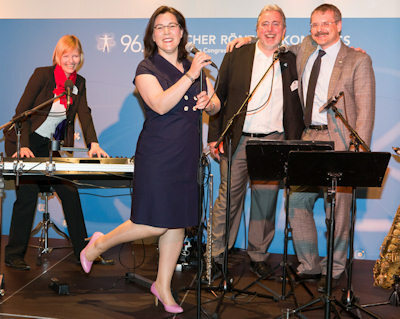 This year's good cause was the rebuilding project at the Roentgen Museum. Another new format was the "skills lab" by the AGMF, a working group dedicated to academic research in radiology within the DRG. 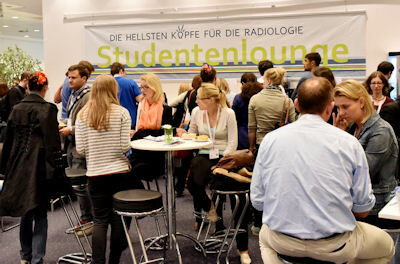 "We want to provide young, enthusiastic radiologists with necessary skills to successfully plan, design, and publish their own study," explained Dr. Michel Eisenblätter (King's College London), who is head of the working group. The "skills lab" was introduced last year and will be continued with new topics in 2016. One highlight was certainly the lecture by current Editor-in-Chief of European Radiology Dr. Maximilian Reiser, who gave a talk to young academic radiologists on how to prepare an excellent paper for publication. The DRK students' lounge was provided exclusively for medical students selected for support from the DRG. This scheme covers travel expenses, as well as congress attendance in Hamburg, and is part of "die hellsten Köpfe für die Radiologie" (the brightest heads for radiology) initiative. After three and a half days packed with networking opportunities, new scientific data, and refreshed knowledge in clinical radiology, there is no doubt that 96th DRK was a great success. Next year the scene will be set for Leipzig. Being the second largest city of Saxonia, it is not only famous for its vast architecture, fairs, and rich cultural heritage, but also for hosting a central event that proved to be the turning point in Germany's postwar history in 1989.